THE SPINOZAS take lyrics from medieval Arabic, Persian, Hebrew, and Romance poetry and combine it with music by Dave Solider influenced by the Mid East, Flamenco, and "acoustica". "Grab-bag pop music of the medieval variety. Well, the Andalusian tradition from which Soldier's new group draws actually predates the Christain conquest, so the reliably weird composer's outfit will collapse upwards of 500 years and more than a couple major culture clashes into a flurry of clappers, flamenco guitar, Middle Eastern percussion and multilingual wailing." - Provan, Village Voice, Jan 4-10, 2006. "Over the years, Dave Soldier has poked into all sorts of adventurous corners, frrom ferocious contemporary classical fare with the Soldier String Quartet to blues rock with the Kropotkins. 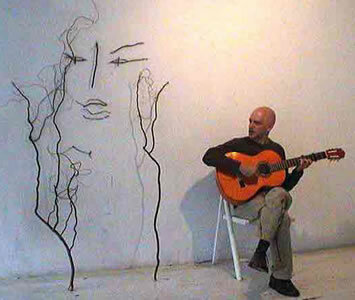 Tonight, he picks up a flamenco guitar to explore Andalusian folk-song traditions." DAVE SOLDIER: Composer and Flamenco Guitar: credits include the Soldier String Quartet, Thai Elephant Orchestra, John Cale, Kurt Vonnegut, Kropotkins, etc. ANA NIMOUZi: Israeli vocalist of Moroccan and Iranian parents. She did most of the translations of the lyrics (see below). The Spinozas explore the very beginning of the European pop and art song traditions. This occurred medieval Andalusia (c 800-1300) , when the country was run by North African and later Arabic Muslims, and during much of which Muslims, Jews, and Christians lived under the Cordoba Caliphate and developed many new art forms. This was the birth of song form with verses and choruses - the Arabic names for these lyrics was muwashshaha and zajal - which were different than the rhymed couplets in previous lyrics from all three traditions. These poems, hundreds of which survive, were always sung, and imitated by the singers up north in Provence. That became Provencal poetry, while the Andalusian oud (imported via Baghad from Iran) became the lute and guitar - the poetry directly began the troubador and mesitersinger traditions. This "Golden Age of Hebrew Poetry" AND "Golden Age of Arabic Poetry" initiated virtually the entire Western song repertoire, meaning Schubert, the Beatles, Hank Williams, opera, and most of the other art and pop music of our world. In addition to the most popular present day song forms, the guitar and lute, the European horse riding tradition (another story), European sheep herding and the wool industry (also another story), the Kabala and contemporary Jewish theology (OK, another story), the acknowleged start of the European poetry tradition, the novel (re: Don Quixote), knighthood, the European rediscovery of the ancient Greek scientific tradition, the importation of algebra and the concept of zero to Europe... this period in Andalusia was the start of the western orchestra, a term that came from the sitara, the cloth separating the audience and dancers from the musicians behind. 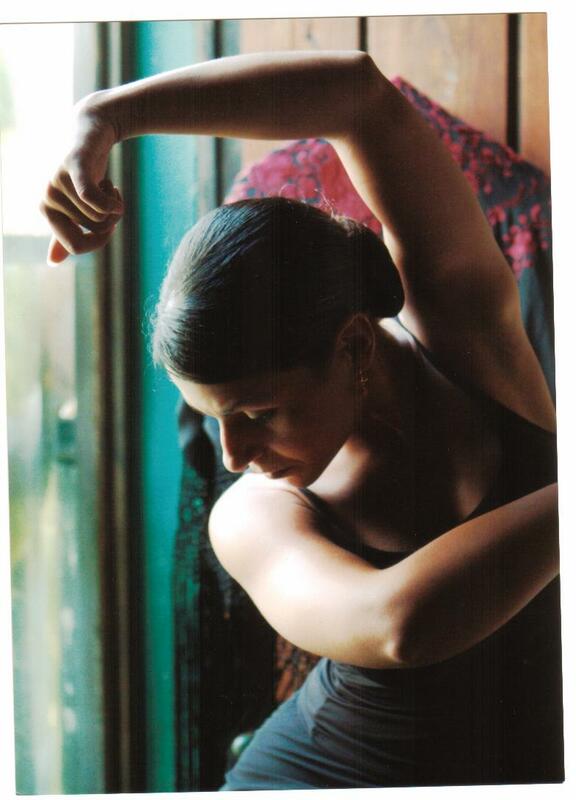 The Andalusian dance crazes that spread throughout the new and old world, such as sarabandes, bourees, to become the rennaisance baroque dance suite and eventually the sonata and symphony, and many of the dances still used in salsa and ballroom dancing. We rediscovered the old poetry in Arabic, Hebrew, Farsi, and ancient Spanish or Romance, some of them in Soldier's visit to Andalusian bookstores and libraries. We combine it with Soldier's music which freely adapts flamenco, middle eastern music, along with salsa, and electronica (although the instruments are acoustic and it can all be performed outdoors - we're calling it acoustica). Florid and emotional, and dance music, also part of the old tradtion. With Dave, Ana, Maurice, Paul, Maya, Lilliana , Satoshi, Tom, Richard and Tiye'. The"concert" side of this music, and for the first time we perform two classical versions of this medieval lyric poetry (known as muwashahat), "Ya Zah'eri fil Duha" and "Lamma Bada Yatathanna" associated with the great Lebanese singer, Fairouz, as interpreted by the great Lebanese oudist, Maurice Chedid. With Dave, Ana, Alby, Maurice, Paul, Rebecca, Tom, and Tiye'. Dave Soldier on Guitar, Ana; Vocals, Richard Khuzami; Percussion and Lilliana Morales; Palmas. "A SPIRITUAL TALK BY VITALY KOMAR"
The Cooper Union, Humanities Gallery 51 Astor Place b/w Third and Fourth Aves. FROM SAMARKAND TO CORDOBA There was a time when science, music, and art in Islamic lands represented high culture to Europe. These cultural strands continue to influence the world today. Elaheh Kheirandish of Harvard University will tell us about mathematics and science in the medieval Islamic world. Dave Soldier, a leading improvisational musician and composer on the New York scene, will play with his new group, The Spinozas (including Ana Nimouz, Richard Khuzami, and Nelida Tirado), who mix contemporary gypsy/flamenco style with Middle Eastern traditions and the lyrics of Al Andalus. Islamic art historian Carol Bier will bring two contemporary carpets from Turkey, woven using traditional methods with natural dyes. Comparing patterns and the uses of color, she will explore symmetry and symmetry-breaking in what we call Oriental carpets. And all of her advocates will mourn cry and ache. Vekol Mee Shetamach Ba Mitabel Veboche. and to the tears that flow like a stream. All hearts are wandering to Kaba. I am torn by the passion who calls to everyone who believes in love. you called the sinner to come back to you. cant you see our love is forbidden? "Hatireh Et Meor Panay Vatera"
his love , in my heart is guarded. "When youll see my radiant face- will you be afraid?" to the sound of violins and melodious harps. “will you drink from between my lips grape's blood”? written in golden ink on the robes of night. Minkum Elchusnu, Wamin Awnee Elnathar. he kindled his lover heart (when he lived with him)? is my heart a sinner because I am in love? all the beauty comes from you, and the sparkle is coming from my eyes. a full moon that is captivating with his recognized charm. a full moon that appears with is fullness glory, proud of his beauty. keredlo de mi betare su a raqibe! but his chaperone (spy) wants to keep us apart! lo quiere apartar de mi su espía! Onma-ch-ke zema nehan hami shud. There, in the absence of I, joy filled my heart. And from that longing, birth was given to me. I am eternally drunk, without wine. My joy is endless, without I. Do not remember me, ever. For I am memory itself, without I.
O me, may you always be without I. All opened when he let me in, without I. Free from obedience and corruption, without I.
Velu Lakach Chatzee Malchut Negeedah? her only son in his arms as he parted?